I was inspired to create this blog by my friend, Lisette Diamant. Her blog, MarketingFUNatic, illustrates her love for marketing with fun blurbs and posts about what is going on in the world of marketing & advertising. Lisette and I both being marketing majors at the same university (Bentley University in Waltham, MA) we were interested in different aspects of marketing. She focuses on the agency and advertising side, where my heart is in the event planning side. I got my first taste of event planning at my first job. I was 14 years old, and working in the kitchen in a very well-known place on the North Shore, The Danversport Yacht Club. The hype and excitement that was happening all the time convinced me that this was the field I wanted to be in for a long time. Well, I'm now almost 23, and still find myself working at The Danversport Yacht Club (DYC). Thankfully, I'm not still in the kitchen, and now have a much more hands on role in the planning. I've held many positions at DYC, the one now being a Function Waitress, as well as an Event Assistant. The waitress part is a lot of fun--I get to meet people from all over, and it's my responsibility that the people at my tables have the best night possible. The Event Assistant position, although not as frequent, is just as great. Here, I get to sit down with clients (which a lot of the time are brides and grooms trusting us to make sure their special day is perfect), and plan out each detail of the night: What time will everyone be arriving? Is there a cocktail hour? Open/Cash bar? Is someone taking photographs, if so, who? If someone taking video, if so, who? What about cake? Flowers? Centerpieces? Decor? Tablecloth and napkin colors? Limo service? Lunch/dinner menu? These are just a few of the things necessary to look into, on the planner side. Every little detail is just as important as the next. A lot of times, you ask questions that the client didn't even think of--this makes you look real good, and shows that you know your stuff. I've also held an Event Planning Internship aboard Yacht StarShip. 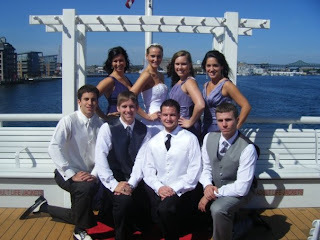 In the summer of 2008, StarShip cruised up to Boston to spend the summer, and I was lucky enough to be a part of it. This internship not only gave me event planning experience, but it came along with networking opportunities, as well as the opportunity to attend other functions to see how other people do it. 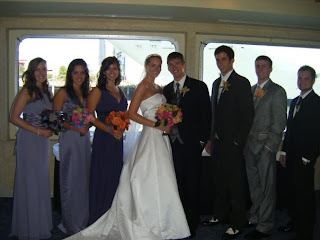 At the end of the summer, my intern project was the first Boston Wedding Expo aboard the yacht, where we had vendors donate their services (among them being David's Bridal, Ourplace Tuxedo, and Cakes for Occasions). We invited newly engaged couples from the Boston area to cruise for free, have a full course meal, dance, and had a fashion show modeling off the bridal gowns and tuxedos. It was a great day for all involved. I have a lot of pictures to show, and will set up a Flickr page soon to put them on. They look good, right? Keep in mind, they aren't professionals, but they sure do look it! So what am I up now? I wish I could say I still had a full hand in the industry. I graduated this past May 2009 from Bentley, and needed to find a full time job to start paying off all of those student loans. I was looking for positions in the Event Planning Industry, but with the economy the way it is, that wasn't playing out like I had hoped. But who knows--maybe this blog will lead me to starting my own Event Planning firm someday (which is what I would ultimately love). For now, I am working at e-Dialog in Burlington, MA as a Production Assistant. e-Dialog is the provider of advanced e-mail marketing and database technologies (and no, contrary to popular belief, we are NOT spam!) You know those e-mails you get from Bed, Bath & Beyond, or Marshalls, or American Airlines? Ya, that's us.